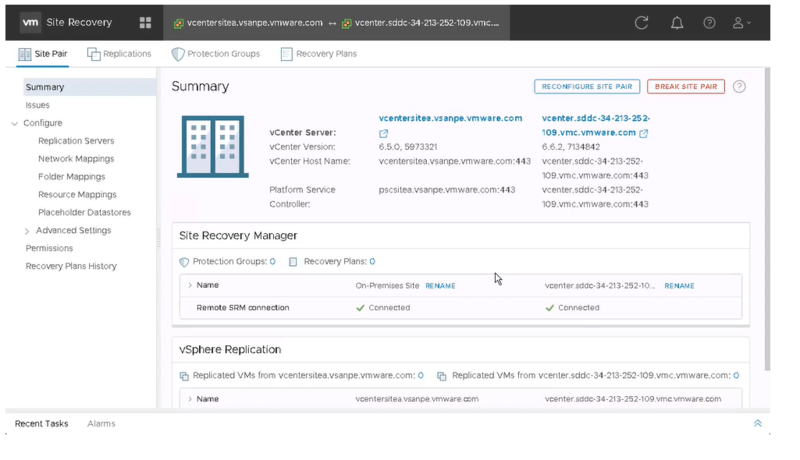 vSphere Replication deployed as an appliance both at recovery and protection site. 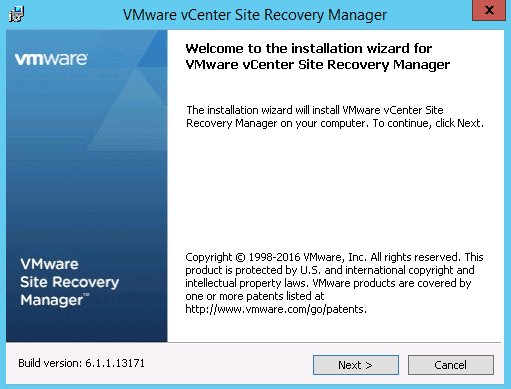 VMware vCenter Server version 6.0 U3 or 6.5 at the customer site as well. 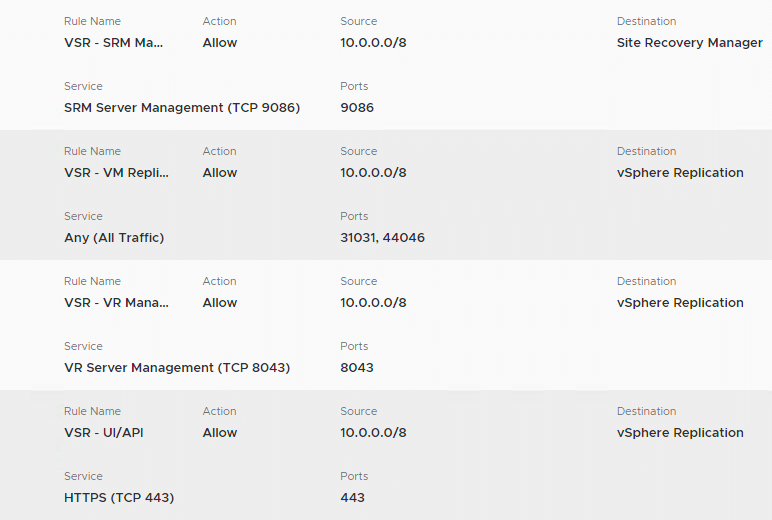 One or more vSphere hosts are running version 5.0 or higher at the customer site. 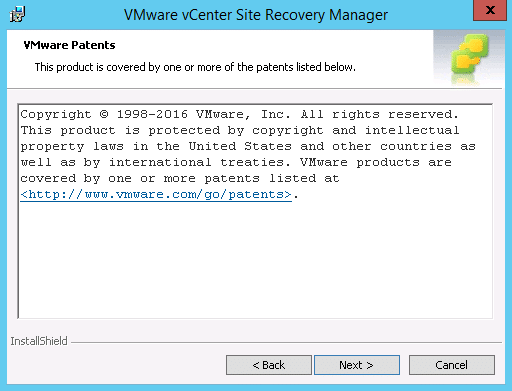 VMware Site Recovery, VMware vCenter Server, and workloads both at the protected and recovery sites require services like DNS, DHCP and Active Directory. 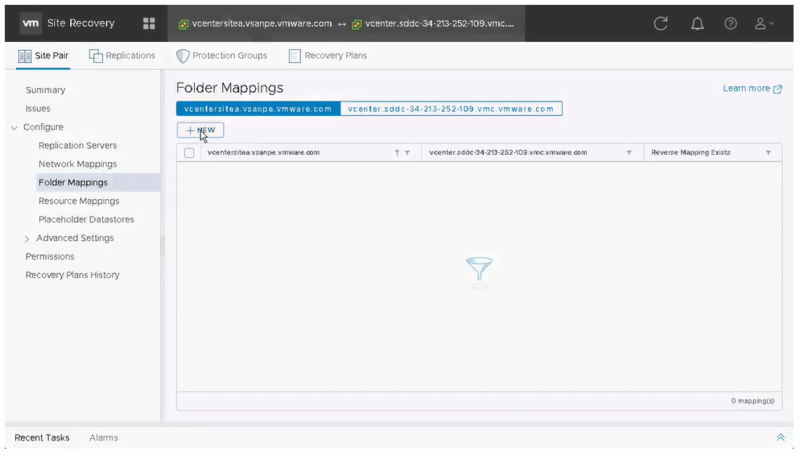 Offers protection to on-premise datacenters against unpredicted disasters by proactively shutting down VM’s gracefully in protected sites and starting them over to DR site. 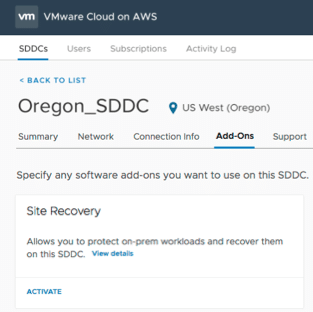 Offers protection to VMware Cloud on AWS SDDC’s by using the on-premise infrastructure in the event of any cloud-related downtimes. 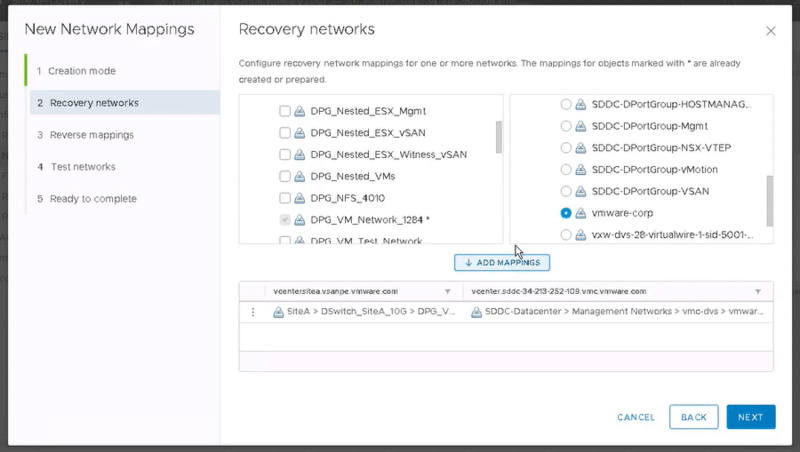 Offers protection to VMware Cloud on AWS instances by starting them over to the configured recovery site in the cloud in case of an unpredicted failure in any of the region and Availability Zone. (AZ). 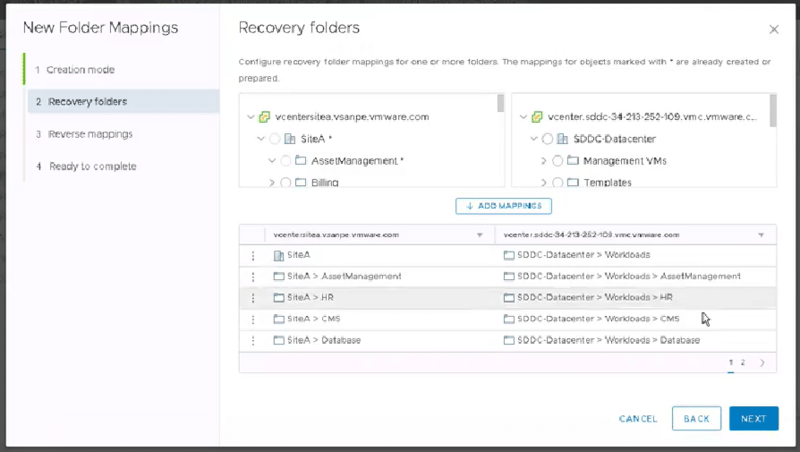 VMware Site Recovery protects up to 500 virtual machines, 250 recovery plan and up to 250 protection groups. 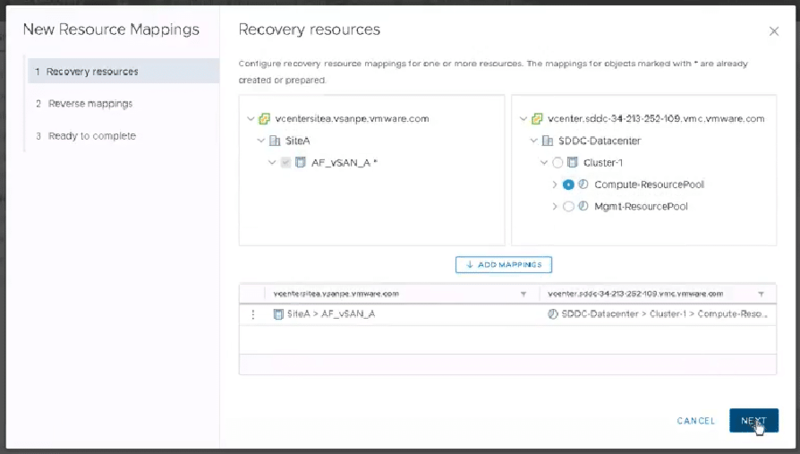 Before you can use VMware Site Recovery, you must activate the service on VMware Cloud on AWS, prepare your on-premises environment, and connect your protected on-premises site with the recovery site on VMware Cloud on AWS. 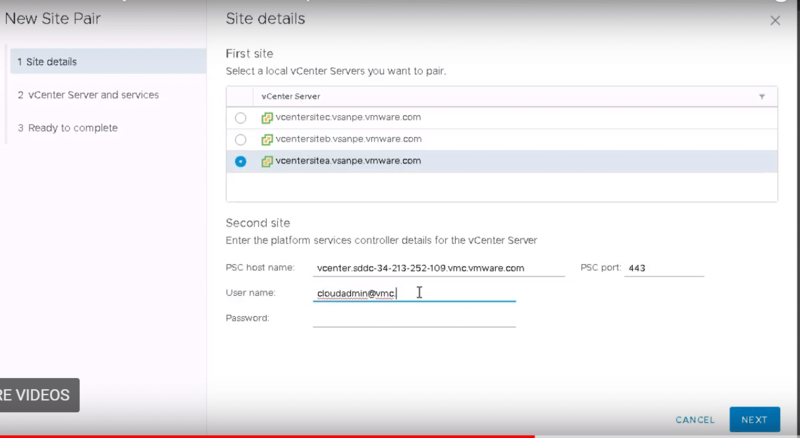 Set up your VMware Cloud on AWS account. 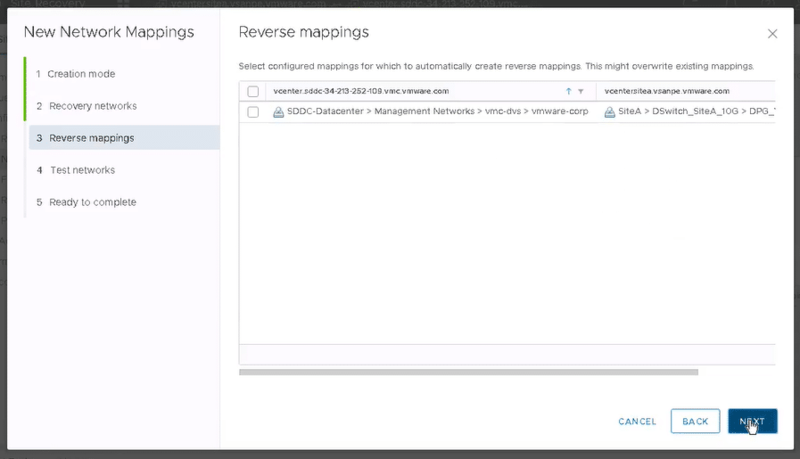 Deploy a Software-Defined Data Center on VMware Cloud on AWS. 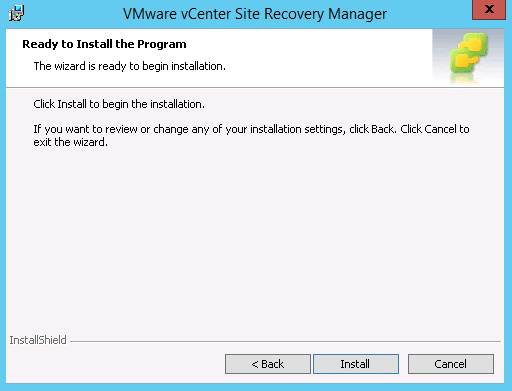 Activate the VMware Site Recovery service. 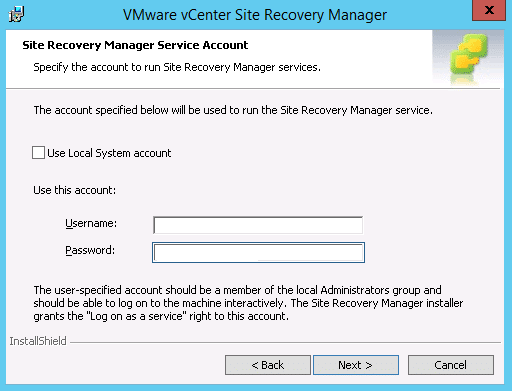 In this article we shall cover the process of activating site recovery service, installing the on-premises services, configuring the firewall rules on VMware Cloud on AWS and pairing the sites. 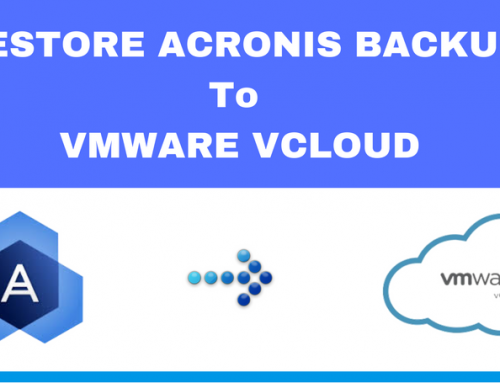 In the end, you would be ready to start replicating and protecting virtual machines. 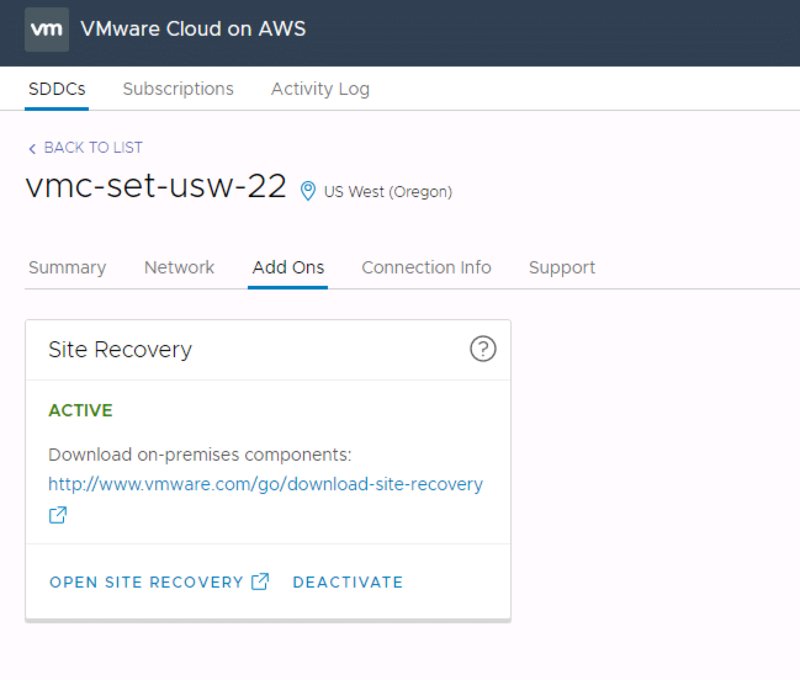 Once Site recovery is activated on the VMware Cloud on AWS side, on-premise components can now be downloaded. 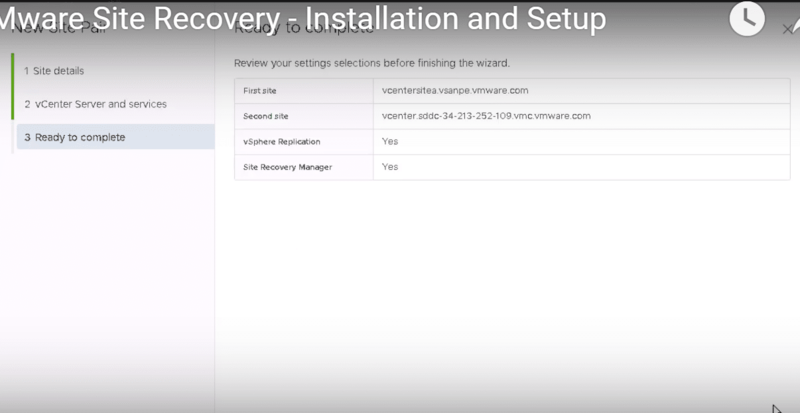 If protecting an on-premises environment, deploy vSphere Replication appliance and install VMware Site Recovery Manager on a Windows server. 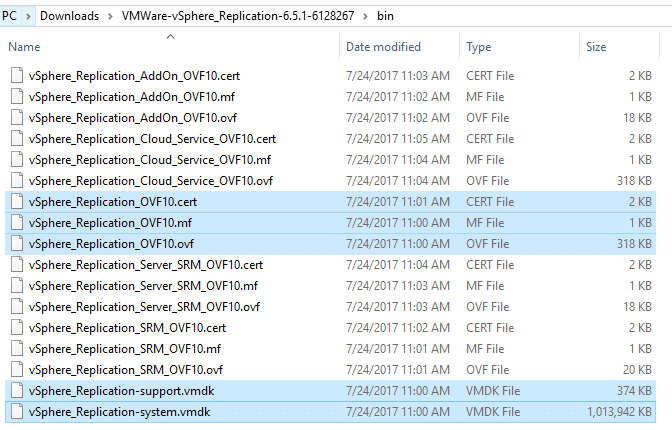 When deploying an OVF using the vSphere Web Client, only specific OVF files that include the CERT, MF, OVF, and two VMDK, i.e. 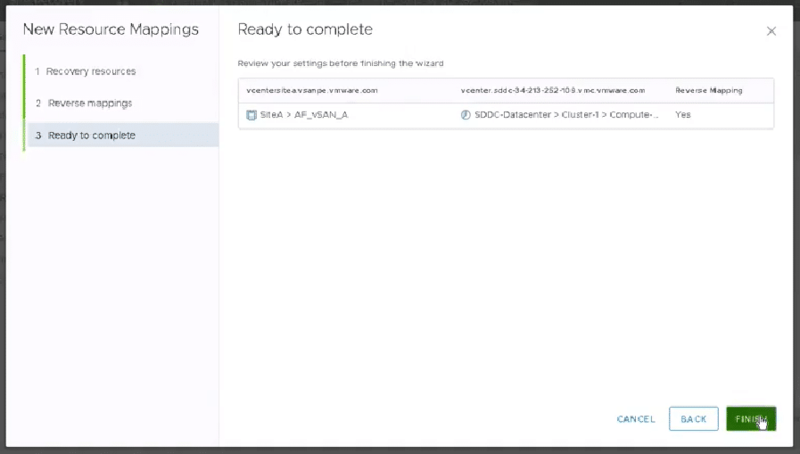 support and system VMDK are involved during deployment of s VR appliance. 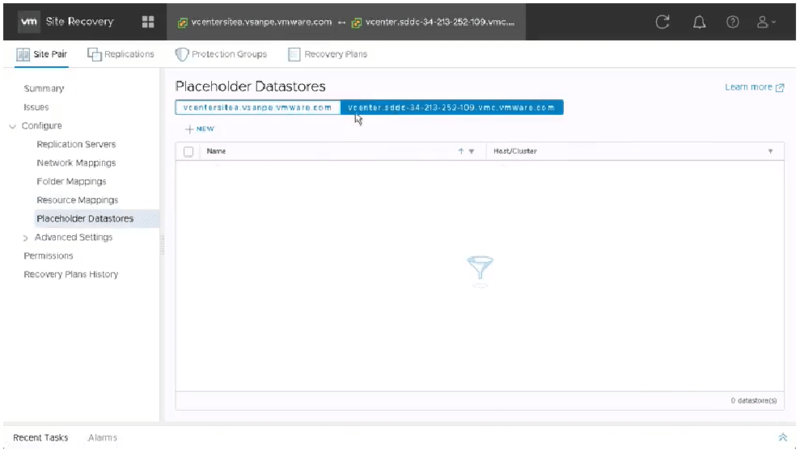 Select Name and location of the appliance, Datastore as the storage, choose network details. Click Finish to complete. Login with the root credentials specified during the appliance deployment. 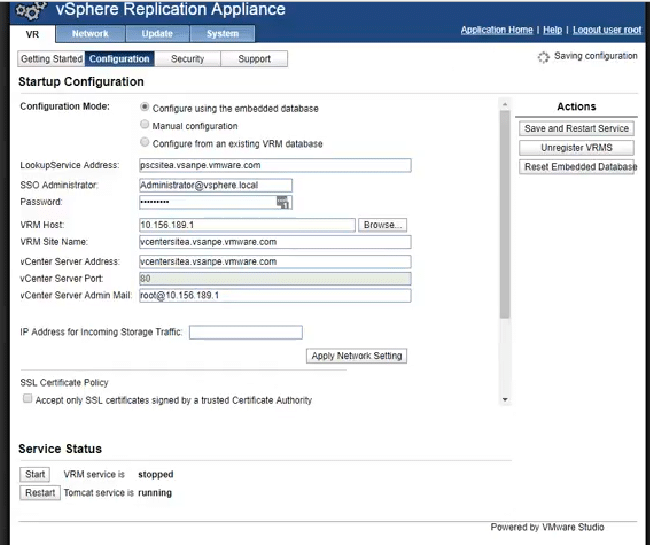 On vSphere Replication appliance, Click on Configuration. 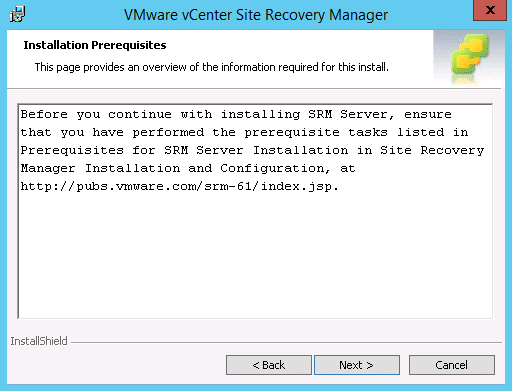 Right-click the SRM setup file, select Run as Administrator to begin VMware SRM installation. Choose English(as preferred) as the language. Click Ok.
Click Next to launch the install wizard. Choose Next to install prerequisites. 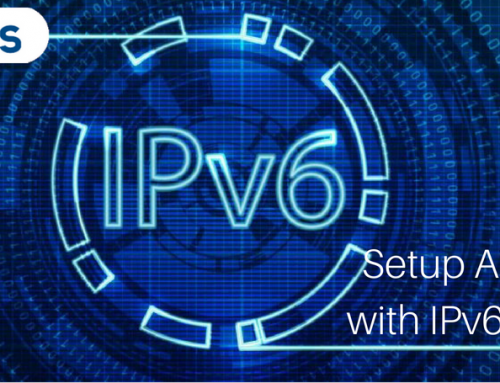 Enter IP address or FQDN of the PSC and credentials to connect to the PSC and click Next. 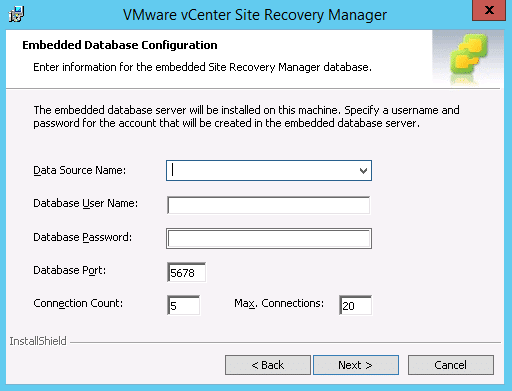 If using an embedded database for your vCenter, enter your vCenter Server details. 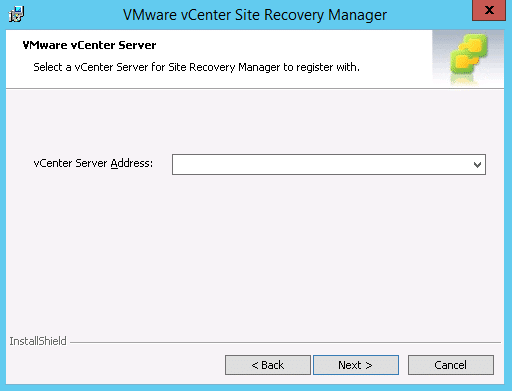 Select the vCenter server in the drop-down menu. 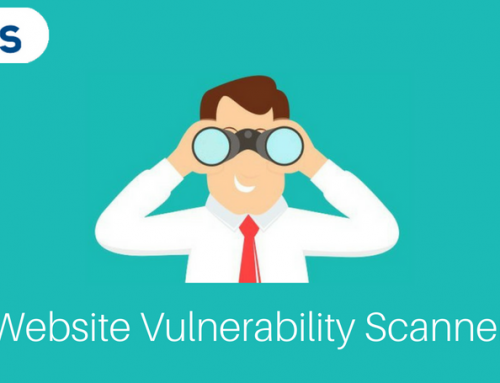 For environments with multiple protected sites create a custom identifier. Click Next. Select Automatically generate a certificate or upload one of your own if required, and click Next. Select a database server. Choose embedded and click Next. If you are using an external database, reference the external data source. Click Next. 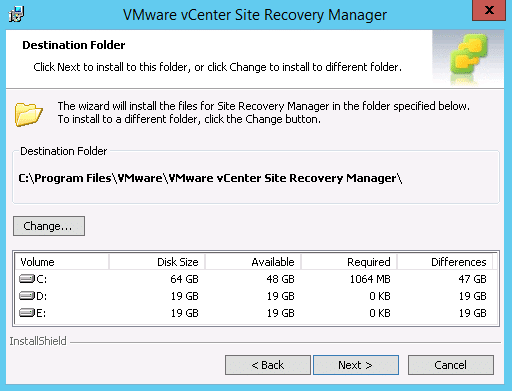 A Site Recovery Manager icon appears in the vSphere web client for each vCenter Server installed. 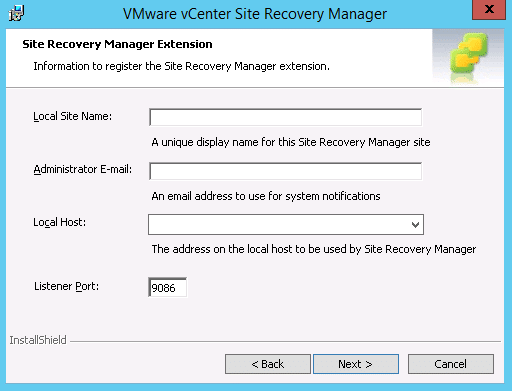 Site pairing connects VMware Site Recovery and vSphere Replication at the two sites together. It enables the two sites to operate with each other. 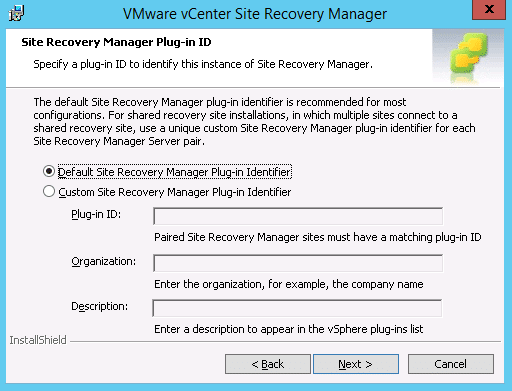 On the Pair Site, Recovery Manager Servers Enter IP address or FQDN of PSC for the recovery site and click Next. 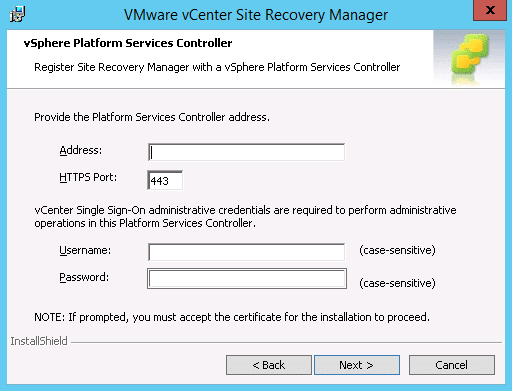 Select the specific vCenter Server and enter Single Sign-On administrator credentials. 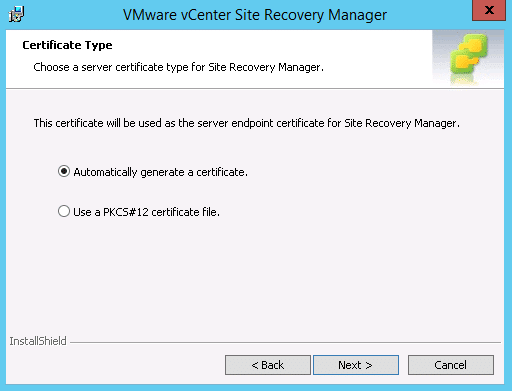 The referenced PSC for a registered SRM is checked for installation. Click Next to pair the sites together. Click Next to complete pairing. 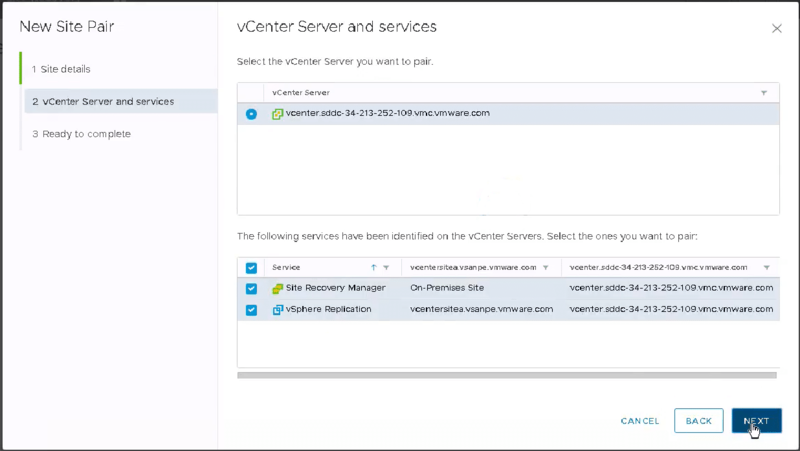 The summary window displays the paired vCenter servers; on-prem and the VMware cloud SDDC. 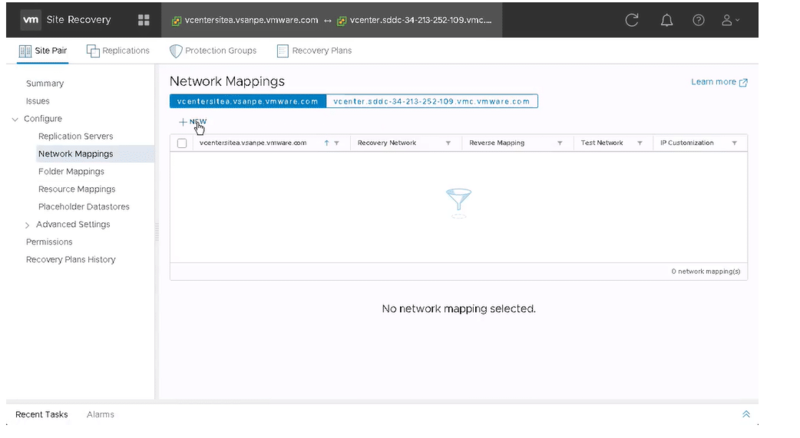 Select to map networks automatically, or to map networks at the protected site the failover site manually. Click Next. 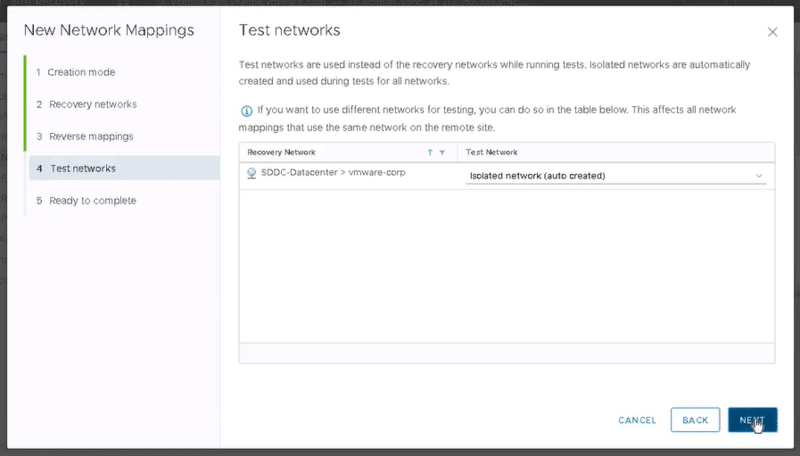 Review the test networks, default settings unless you have a specific isolated test network you want to use. Click Next. Click New to start Folder mappings wizard. Choose the folders to map for both sites and click Finish. 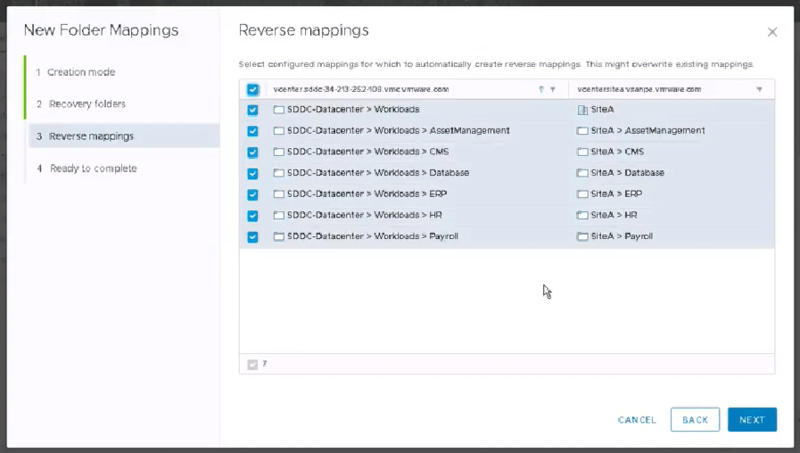 Select automatically map folders and Click Add Mappings. Click Next. 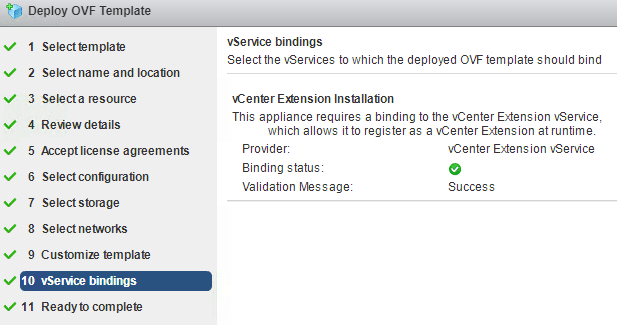 On the vCenter servers, select the resources from both click Add mappings and Next. Choose to reverse mappings, using the tick box if required. 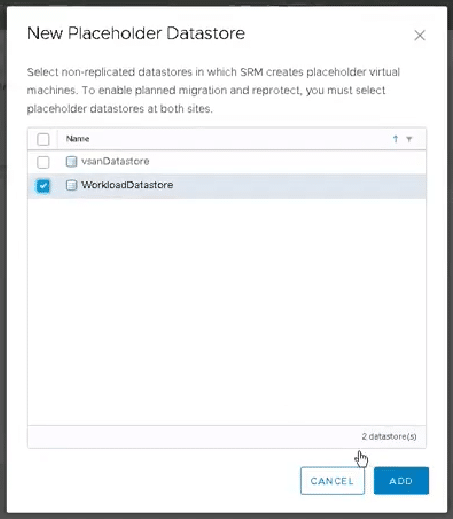 Select the Placeholder Datastore, click Add. 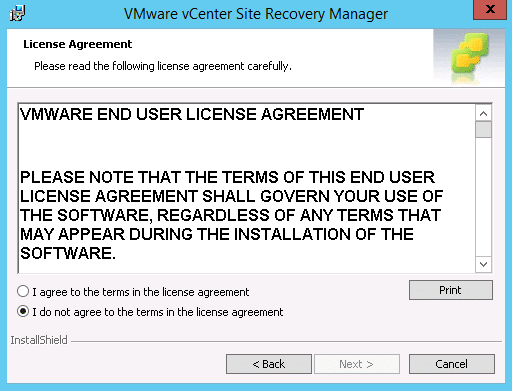 You are now ready to start replicating and protecting virtual machines. Cloud is here to stay. Organizations that are shy to move to the cloud can embrace both the on-premise data center and public cloud by leveraging technologies that integrate into both worlds. 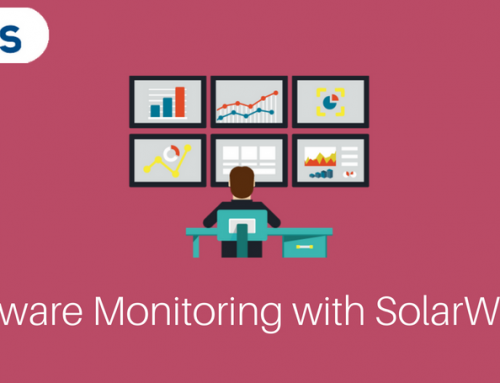 Software-defined infrastructure has made this easy and eliminates the worry of application portability and lack of in-house skill set. 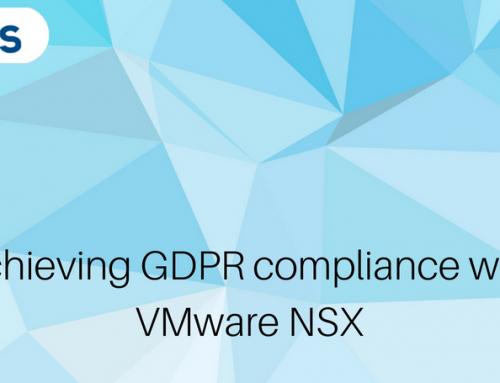 DraaS protects on-premise data center and VMware Cloud on AWS seamlessly giving organizations a peace of mind.